Some new clients – Mike, Jack Bower, and Steve. OK – so this blog was supposed to just be a couple of weeks late and now here it is some 3 plus months late. This year I am employing a blog format I stole from a friend who stole it from someone else. I have been counting everything up, so here is our summer in numbers. And lucky for you – since all this happened so long ago now, I have forgotten some of the boring details I meant to include originally. 19 – Number of weeks we house sat in Cabbagetown this summer. Arriving May 27, we started house sitting May 29 until October 8 with only a few gaps (homeless days) in our schedule here and there. 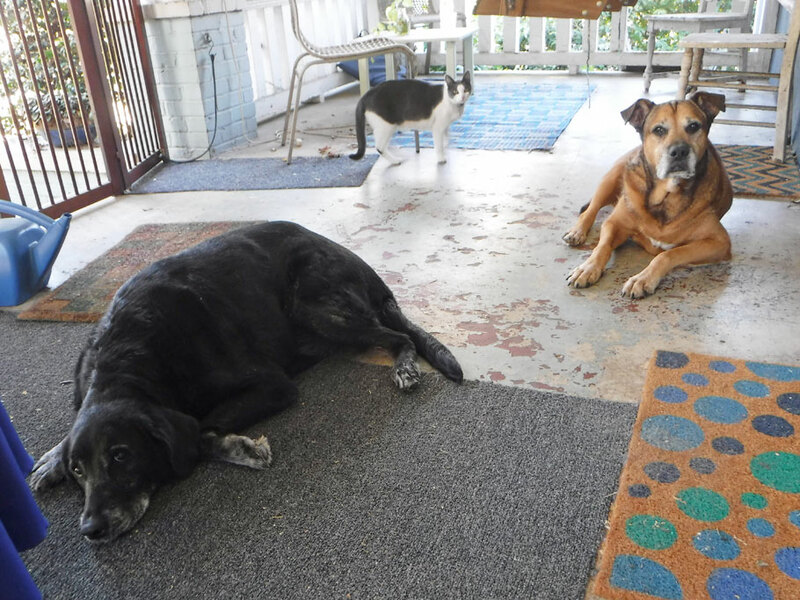 20 – Number of pets we house sat. 12 Dogs and 8 Cats. Can you guess which ones are cats and which are dogs: Annabelle, Mr. Chein, Otis, Daisy, Bob, Dave, Charlie, Ruby, Chatter Box, Friday, Mike, Steve, Little Joe, Jack Bower, Gus, Zola, Max, Lucy, Nola, Cosmo? 12 – Number of different homes we lived in. 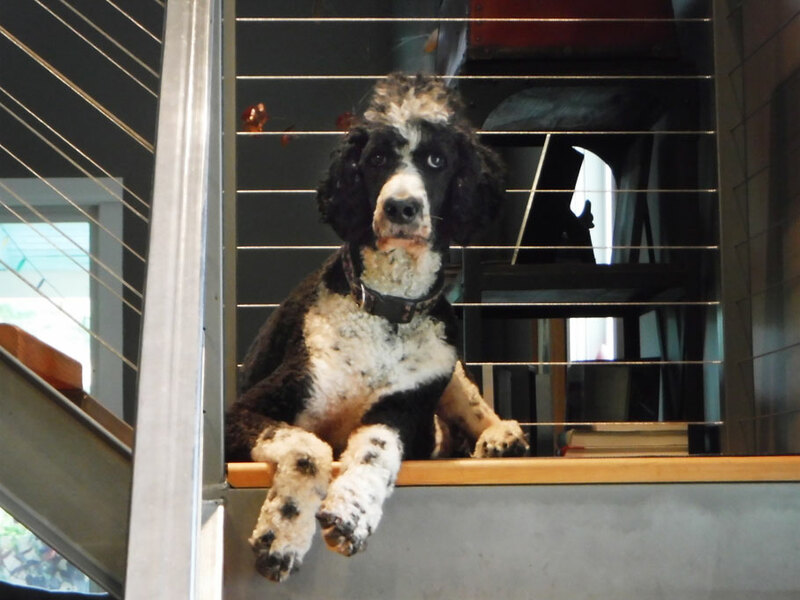 Only 9 of those had pets – which, if you do the math, you can see we sat an average of 2.22222 pets per pet inhabited home. 20 – Number of times we moved. Although we only stayed in 12 different houses this summer, we stay in a few of them multiple times. When we arrived in Cabbagetown we had 14 weeks booked. This was pretty awesome. We still had gaps in our schedule, but as usual they filled up with little effort soon after we arrived. But still a few weeks in September remained open the entire summer. As these homeless dates approached after 17 moves, the thought of moving again started to wear thin and we thought we might prefer just living in the van rather than moving one more time. I kept putting off putting any effort into looking for another place to stay, but as our luck goes – a week before our impending homelessness, I was at a party talking to a friend whom I hadn’t seen all summer and who had bought a house in the neighborhood earlier in the year, but was waiting for renovations before she moved in. She told us if the contractor weren’t there Monday morning we were free to move into it. So, we moved into our friend’s empty house with our futon from the van and all of our cooking supplies. We borrowed a table and some chairs from a friend. And for the first time in months were able to empty some of traveling bags and put stuff away in cabinets – which although it seems like such a little thing, it was great after living out of suitcases for so many months. By the end of the week another house sitting gig popped up out of nowhere and we were set for the rest of our time in Cabbagetown. Otis Redding was one of our faves. 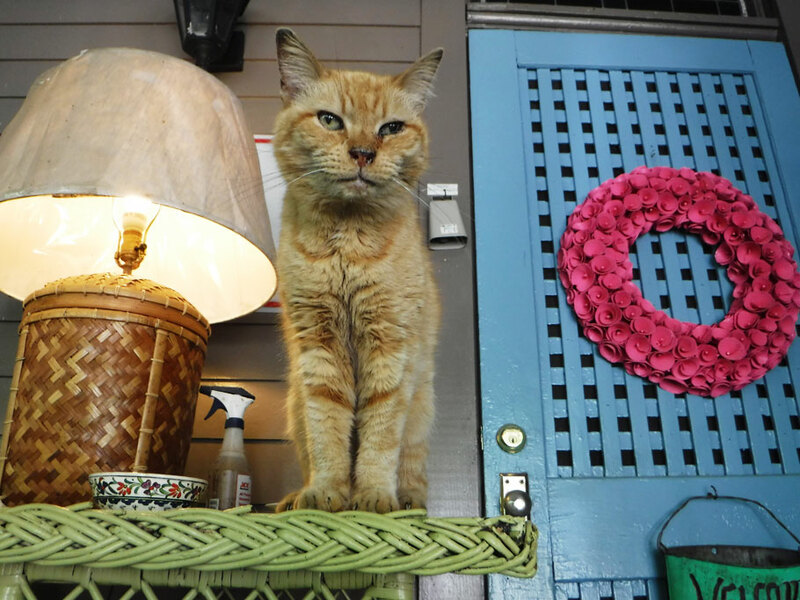 He lived a long life and was well loved. We will miss him this next summer. 3 – Number of parties on a roof – One of the best roofs in Atlanta is on the old Fulton Bag Mill converted into lofts in Cabbagetown. It has spectacular views and lucky us, good friends own one of the lofts in the building and love to host parties. 2 – Number of parties in a grocery store – A new super Kroger Grocery Store opened up about a mile down the road from Cabbagetown this summer. A few of the things that make it super is the Starbucks, the food court, being able to buy bath towels, and the salad bar inside the store – but what makes it really really super is that it has a bar that serves beer and wine. The Krobar was hopping this summer with live music on weekends – it is hard to believe we live in such a big city with so many great restaurants, music venues, theaters, etc., but open a bar in a Kroger grocery store and you’d wonder what we ever needed all that cultural stuff for. 4 – Number of going away parties (counting our own) – We knew lots of people who moved away from Cabbagetown this summer – some for job opportunities – others because the prices of homes in the neighborhood have jumped so high, people have decided to cash out while everything is hot. And, of course, there is the yearly going away party for me and Greg. It marks the end of summer, the end of our Cabbagetown season, and the start of adventure. There were also birthday parties, holiday parties, baby shower parties, etc. 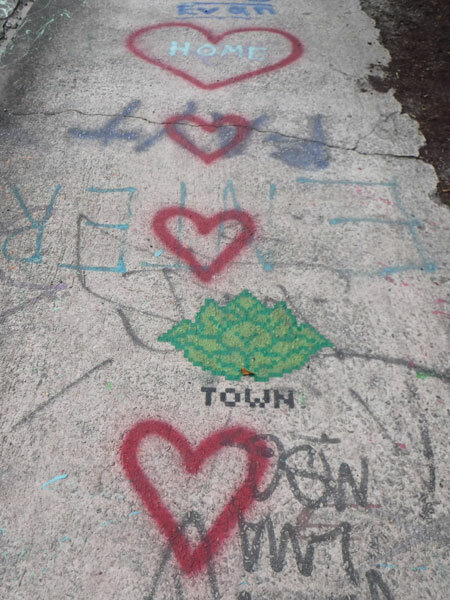 Cabbagetown loves a party – any excuse to stay in the ‘hood and get together with neighbor and friends. 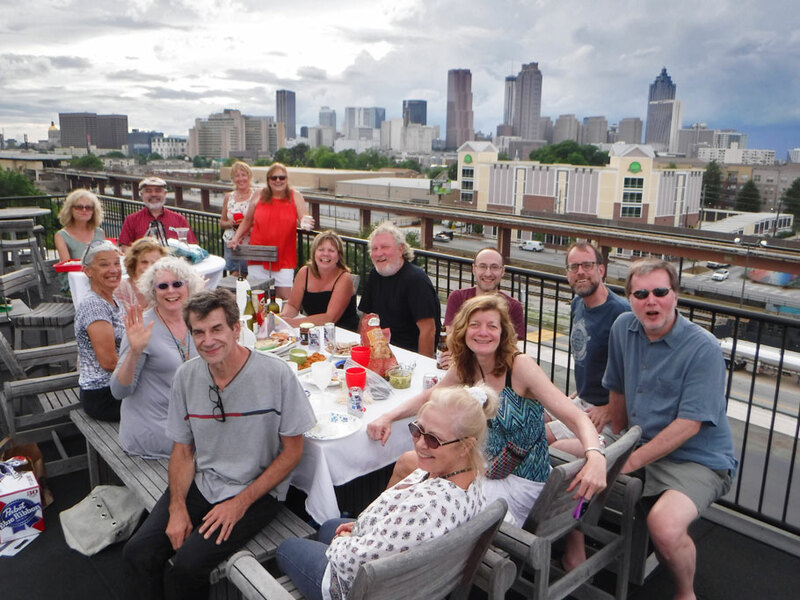 Good friends on the roof of the Stacks Lofts overlooking the city of Atlanta. Greg and Duwan at the Krobar celebrating Duwan’s birthday. 5 – Average number of days I walked anywhere from 3 to 5 (or 6 or 7) miles each week. Why so much walking? See Social above. Lots of desserts at those parties. 4 – Number of trips Greg made to the doctor. So Greg has had foot pain for about a year. He has suffered periodically from ingrown toenails and last December when we were sailing to Key West he became crippled with severe pain in his foot. That pain never really totally went away, then this past spring he realized that he had a fallen arch. He found some exercises online for his fallen arch and the pain was tolerable until he got another ingrown toenail. After doctoring the toenail himself, his foot swelled up and he thought it might be infected. After two visits to an urgent care center and two to a podiatrist he was diagnosed with gout. So what is gout? It is a build up of urate crystals in a joint (such as your big toe). Where do these urate crystals come from? From uric acid in your blood produced when your body breaks down purines. And where do purines come from? – food like steak, organ meats, seafood, sugary drinks, and BEER. 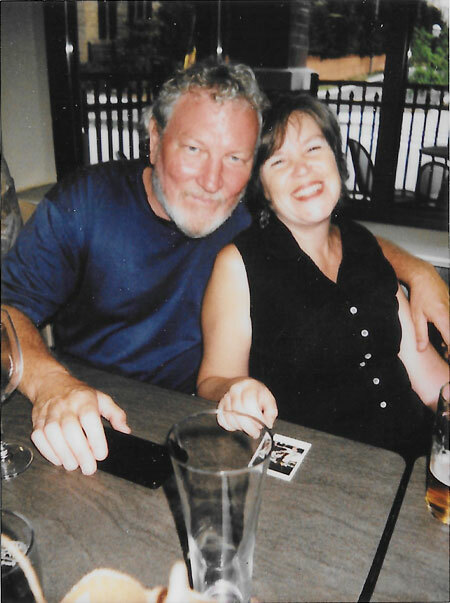 0 – Number of beers Greg drank after being diagnosed with gout. Don’t fall out of your seat – there probably aren’t too many things that Greg likes more than beer, but walking is one of them. 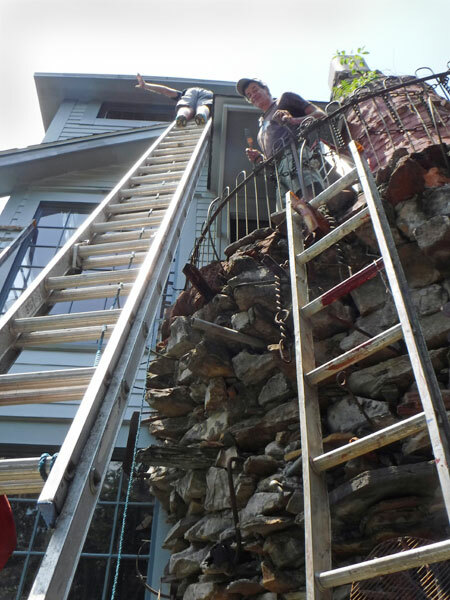 Greg is way up a ladder as his painting partner Paul looks down. 4 – Number of exterior houses and buildings Greg painted with his partner Paul. 16 – Number of interior rooms and hallways Greg painted with his partner Paul. 2 – Number of fences Greg painted with his partner Paul. 2 – Number of porches and decks Greg painted with his partner Paul. Ok – will stop this boring list here – the point is Greg and Paul were really really busy this summer. Greg also did lots of side jobs, odd jobs, warranty work, etc. 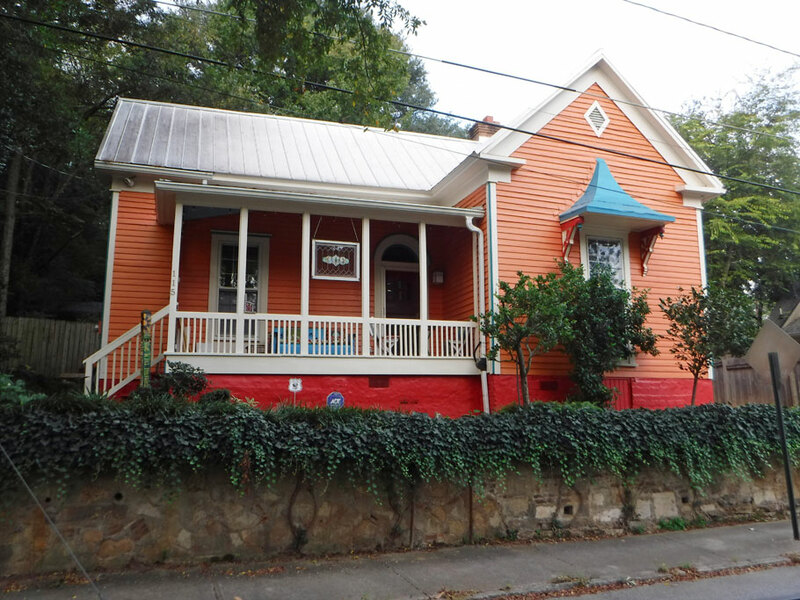 One of the new colorful houses in Cabbagetown painted by Greg and Paul. Another house Greg and Paul painted over the summer. This was our house before we sold it. 50 – Number of days Duwan waited tables. Oops – so much for the end of boring jobs. 2056 – Number of slides, photos and paper Duwan scanned this summer. Since we sold Greg’s folk’s house earlier in the year we no longer had a place to store all of Duwan’s photos and personal momentos, so we spent the summer dragging a slide scanner and boxes of photos and slides around from house to house and using friends flatbed scanners when we stayed in their homes. 2056 hard copy photos, slides and paper have since left our lives. 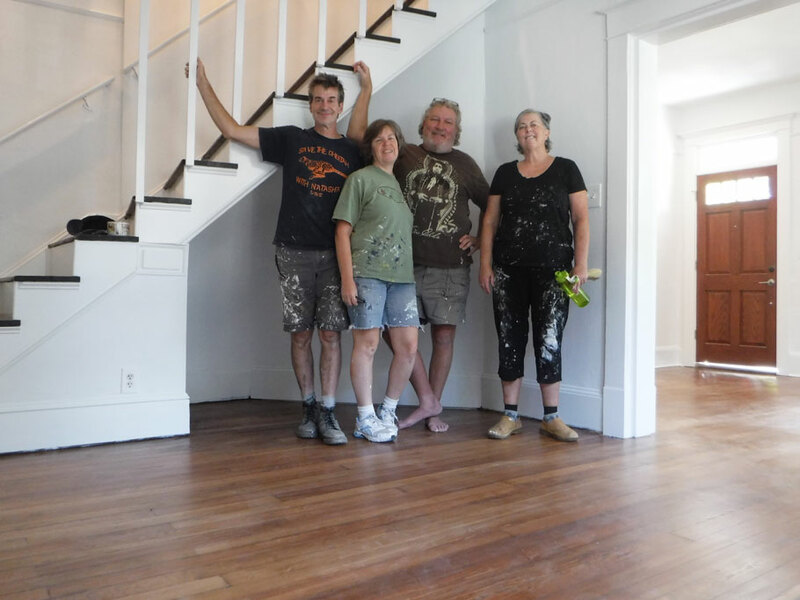 The painting crew – Paul, Duwan, Greg, and Dian. 1 – Number of vehicles we killed this year. Last year, of course, we killed Great A’Tuin. This year we killed the nameless green Honda Civic. We were going to sell the Civic anyways and didn’t want to put the money into fixing it, so we donated it to a local public radio station. Hopefully life will come again to the Civic, just as it did to Great A’Tuin. 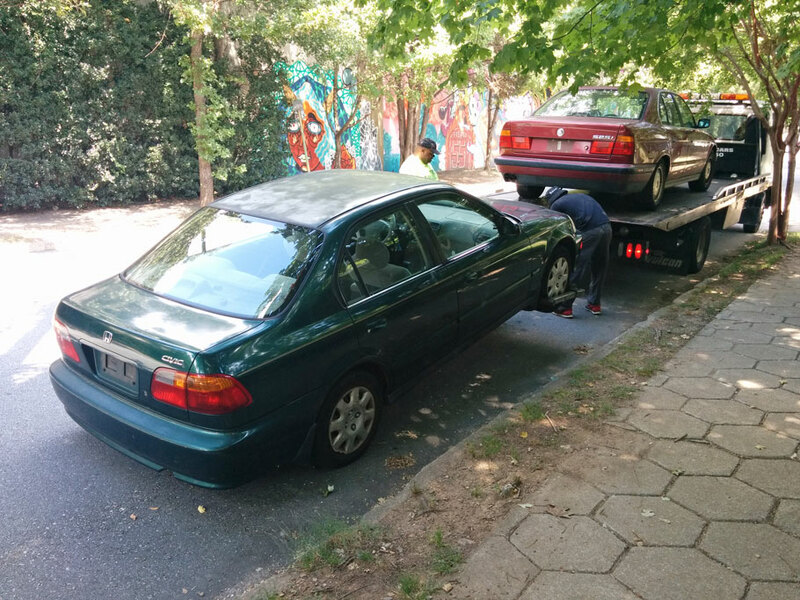 The Honda Civic being towed away. Yeah – so we went to a few concerts, and festivals, drank at the Krobar a handful of times and had big fun with our friends. But mostly this summer was about work and gearing up for upfitting Ballena Blanca, the van. We are taking the winter off from the boat and are on the road now in BB, journeying through the Southwest, and trying to catch up the blog (we have lots to tell you about our van build and where we have been in the last month). And soon we will be back in Cabbagetown for another summer of house sitting, work, friends, and planning a new adventure. Oh and BTW – if you want to keep up with us better, we now have a Facebook page, https://www.facebook.com/MakeLikeAnApeMan, and an Instagram account, https://www.instagram.com/makelikeanapeman. 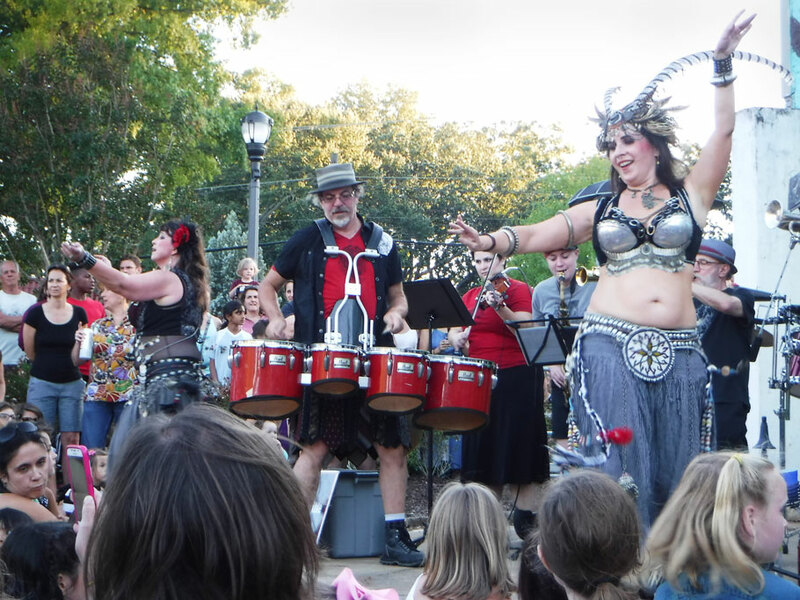 Festivals are always interesting in Atlanta! 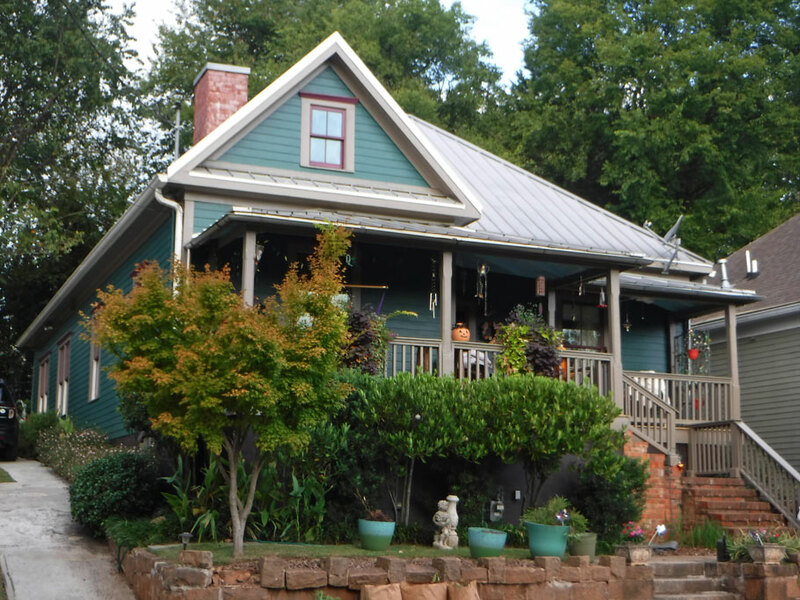 This entry was posted in Cabbagetown, House Sitting Cabbagetown, Odd Jobs Cabbagetown and tagged Atlanta, Cabbagetown, Cats, Dogs, engine failure, painting, pet sitting. Bookmark the permalink. Too bad, I really liked that Honda. Hope the toe’s all better Greg. We liked the nameless green Honda too. Thanks! This is a great recap of the summer by the numbers 🙂 I always love your pictures of the pets you watch. I’m still thinking you need a small pet for your van – maybe a hamster? Thanks! We have Bob the bobble-headed dog for now. Maybe we can work our way up to a hamster. 1. Celery Seed Extract, 2-4 tablets a day, which can get expensive. (or 4 stalks of celery a day). Your results may vary. My wife was allergic to blood pressure pills so Duke recommended celery, which worked fine for her. We ate a combined two stalks a day so one a day was doing the job for her blood pressure. I then switched her to the pills, plus Olive Leaf extract, which was supposed to be even better then either alone. It did work, but she also has hypothyroidism (low temperature) and when I was researching what could cause low temperatures, celery seed extract came up so I discontinued it. That worked and we are back on just celery. I would recommend you try celery by itself starting at one stalk a day and working up to whatever works for you. Celery is relatively cheap and available at every grocery store. I’d buy organic if you can afford it as celery is one of the most sprayed vegetables around. Good luck out west!